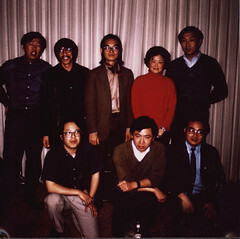 Asian American Studies (AAS) Department, the largest of five departments/unit in the College of Ethnic Studies at San Francisco State University, was created as a result of the 1968 Black Student Union/Third World Liberation Front Student Strike. A settlement was signed on March 20, 1969 to establish the country’s first and still only School (now College) of Ethnic Studies at SF State with the following four units: American Indian Studies, Asian American Studies, Black (now Africana) Studies, and La Raza (now Latina/o) Studies. In Fall 1997, an AAS baccalaureate major was launched, with the first BA class of ten graduating in 1998. Subsequently, the California State University Chancellor’s Office approved the AAS master’s degree program to officially begin in Fall 1999. The Department was recognized in 1994 by the Asian Pacific American Education Advisory Committee of the Chancellor’s Office as an “exemplary” program. AAS at SF State is also the largest AAS Department in the country, currently staffed with 17 tenured/tenure-track faculty and 6 lecturers. In Fall 1969, AAS began its first semester with 17 different courses. The department has now grown to 43 undergraduate and 8 graduate courses (exclusive of supervisory courses). Dedicated to teaching, studying, and serving our diverse Asian American communities, the following ethnic units have been established within the department: Chinese, Filipino, Japanese, Korean, South Asian, Southeast Asian (Cambodian and Vietnamese), and Asian of Mixed Heritage. With over 50 undergraduate and graduate courses taught by over 20-plus faculty, AAS has the nation?s most comprehensive program of study on the Asian American experience, with a commitment to serving our students, the academe, and most important, our Asian American communities. Since Fall 1969, the Asian American Studies Department at San Francisco State University has furthered the understanding of the histories and cultures of Asian Americans and the various identities and experiences of our communities. Through teaching, community service, and research, we use interdisciplinary approaches to address the structural and ideological forces that shape the lives of Asian Americans. We support self-determination by developing the creative expressions, voices, critical pedagogies, and analyses of our communities. Social justice, equity, and activism within Asian American communities, and respect for differences, especially ethnic diversity, are fundamental principles that guide our work. Gain an interdisciplinary understanding of the histories, cultures, and racialization of Asian Americans. Apply course concepts and critical theories and methodologies to identify the structural and ideological forces that shape the lives of Asian Americans. Apply the skills and knowledge acquired toward the self-determination and empowerment of Asian American communities. Develop values of social justice, equity, activism, and respect for differences. Construct evidence-based and persuasive oral and written arguments with proper citations and support from multiple forms of knowledge, including community and academic resources, that communicate what students have discovered. Excerpted below are chapters from At 40 that tells the history of AAS at San Francisco State University from 1968 to 2009. At 40 is available for a donation.